Keep the intimate weddings coming, that’s what I say. If I had any control over it, I would probably do a 50/50 mix of big weddings and elopements, not only to keep things fresh, but also to sneak a few hikes a year in. It just so happens that I had been craving a good winter adventure. The snow fight… the purple hair… the good friend who went out of her way to replace the hair girl last minute… the 3 pair of tights, socks, and built-in bloomers to combat the cold… Sienna’s emotion when putting on the dress that she made herself… the locket with her grandfather who passed away days before the wedding… the fog… the windy freezing fog… the gloriously tempestuous freezing fog. So much I will remember about this one. 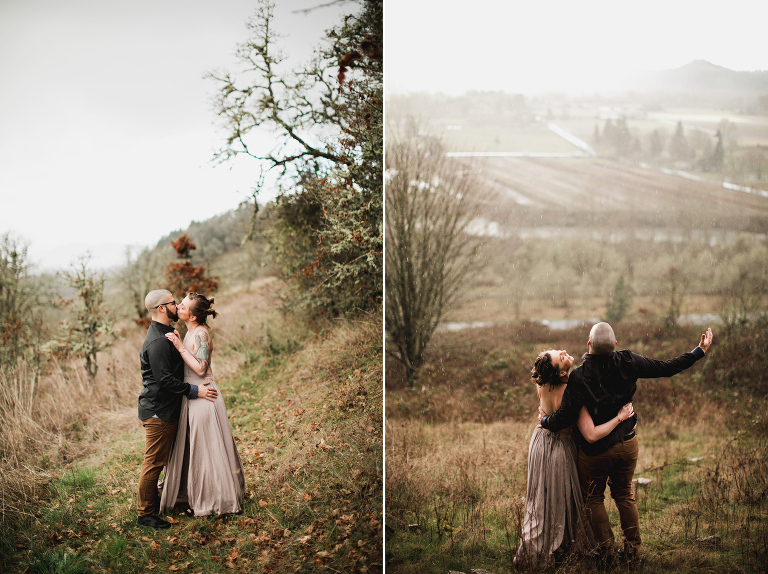 Sienna and Evan love the outdoors and wanted a small ceremony/elopement during the winter, and I’m pretty sure they got exactly what they wanted. So did I. New Year, new life. CONGRATS! Mackenzie Behrle - Wow! This wedding was awesome and so was the photography! I love it. Tori Lee Carlson - Okay Jay. SERIOUSLY?!?!?!?!?!?!?!?!?!!? Rosa Frey - ummmmazzzzzing, jay! Bethany Gilbertson - How on EARTH are there no comments on this incredible, amazing post? bar so high, sir. Thank you for always being inspiring. receive the BEST imagery and will cherish them forever. Bravo. Well done. End scene. jayeads - thanks homegirl. i’ll always be sad i couldn’t make noth weddings work, but such is life 🙂 i enjoyed looking at your photos!!! yes, i wished i was there, but you guys looked amazing. Patty Diaz-Andrade - the rocks, the bride and groom, everything is just majestic. you feel like you’re in an episode of “once upon a time!” Congrats to the great couple! Great work, as always, Jay! Tina Guy - What A Beautiful Wedding!!! Love And Smiles In EveryMoment Captured 😉 Congrats!! Jamie Baron - So incredible… This one got me, for some reason. Maybe the intimacy of it. And then the surreal fog. There’s always that… Bravo. Kassidy Renee Paige - The second half of this set is on a completely different level. You’re a constant inspiration jay! Renee - Wow, this wedding was absolutely amazing! My fiance and I are hoping to do something very similar to this, but are planning it from out of Country, would you be able to tell me where this wedding took place? jayeads - HEY RENEE! I will email you details.